We woke up today to above-freezing weather. 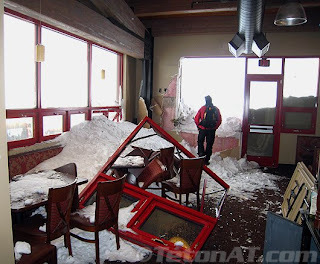 Getting 60+ inches in the mountains and then this warm weather is probably the worst thing that could have happened. All of that is on top of a weak rain layer from the fall. The sketchy snow pack just got sketchier. The beginning of work was like the rest of the week...complete chaos. 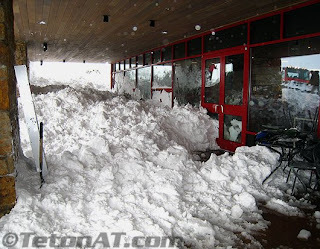 I was working the ski-check area and quickly realized that skis were all over the place. Many of the ski compartments had been double and triple booked the night before. It was a mess. 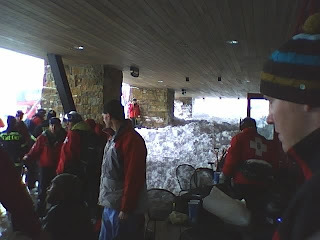 Shortly after the rush began, I learned that the lifts had closed. 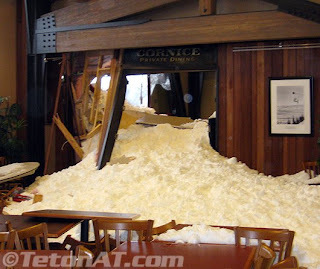 I heard from my supervisor that the headwall had slid and took out the Couloir Resturant at the top of the gondola. Employees were present, but luckily the place was not open to the public yet. 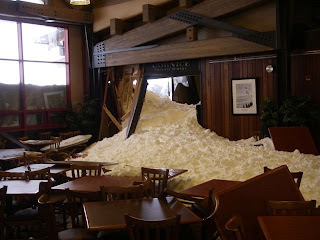 The snow poured through the second floor windows and rumor has it that someone was buried inside. In the end, everyone was okay and accounted for. We stopped renting out equipment once the lifts closed, so most of the day was pretty low key in the shop. We ordered some pizza for lunch and took turns going outside to watch the howitzer shoot off rounds. It was loud. I ended up working a 8.5 hours today which felt good for once. Dana and I came home this evening to yet another surprise. 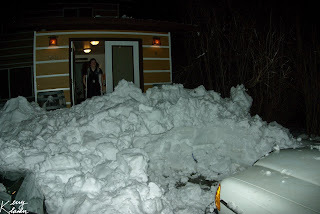 The snow on our roof became too heavy from being saturated with water and slid off during the day putting a wall between us and our front door. 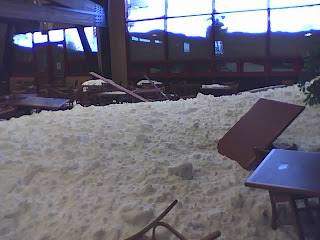 From the ground to the top of the pile, it was probably close to five feet of snow. Some of it landed on the front of my car. 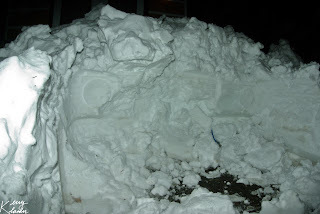 I unburied it and moved it to a new parking spot. Luckily, there was no damage. 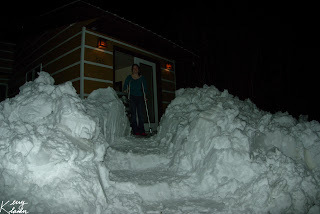 The snow is extremely dense and heavy so all we could really do was dig a temporary path to get in and out of our house. 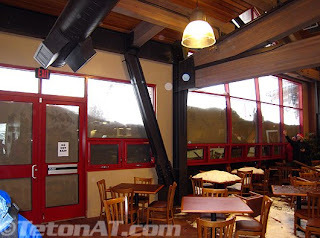 Earlier in the day, there were photos posted on TetonAT of the aftermath of the slide this morning, but they have since been pulled due to pressure from the resort and sheriff. They're trying to keep everything hush-hush. Maybe they will be posted again in the future. They really gave you a perspective of what happened. 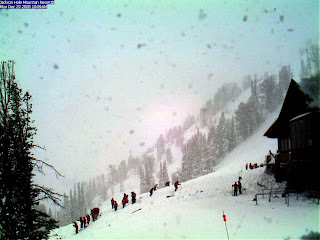 And here are a few photos I dug up from various sites...including a couple from TetonAT before they were pulled.